WASHINGTON, DC –The fifth annual class of the National Student Poets Program (NSPP)—the nation’s highest honor for youth poets— has been announced by the President’s Committee on the Arts and the Humanities (PCAH) in partnership with the Institute of Museum and Library Services (IMLS) and the nonprofit Alliance for Young Artists & Writers. The students were appointed by First Lady Michelle Obama at a ceremony yesterday in the State Dining Room at the White House. As part of an appointment ceremony, each of the students read an original poem. The 2016 class of five National Student Poets was selected from a national pool of more than 20,000 poetry submissions and represents the most promising student poets in our nation. Throughout the next year, each poet will serve as a literary ambassador and will share their passion for poetry and the literary arts with their communities through service projects, workshops, and public readings. In addition, each poet will receive an academic award of $5,000 funded by the Bernstein Family Foundation and will serve as a resource to the U.S. Department of Education and the Library of Congress. The White House Ceremony marked the fifth anniversary of the program with many returning alumni in attendance, and also featured Q-Tip, the Kennedy Center’s first artistic director of hip-hop culture. Since its inception in 2011, the National Student Poets Program has showcased the essential role of writing and the arts in academic and personal success for audiences across the country. All twenty NSPP students have participated in community service projects, visiting more than one hundred cities, performing at over eighty national poetry events, and mentoring hundreds of future poets. They have performed their work numerous times at Lincoln Center, have been honored five years running at Carnegie Hall, have joined First Lady Michelle Obama and Vice President Joe Biden in addressing veterans, and have attended private poetry workshops and master classes with the Ford Foundation’s Director of Creativity and Free Expression Elizabeth Alexander, best-selling author Colum McCann, poetry editor of the New Yorker Paul Muldoon, Macarthur Genius Grant recipient Terrance Hayes, Tony-winning actor Daveed Diggs, and former United States Poet Laureate Natasha Trethewey. Their years of service have seen them returning to the Aspen Ideas Festival, where they have recited their work for notable guests of the festival and experienced an intensive, multi-day youth poetry workshop, and have served as mentors at Between the Lines in Iowa, a summer writing workshop intensive with Silk Road students. United States Poet Laureate Juan Felipe Herrera and acclaimed actor and activist Alfre Woodard have praised the power and importance of their work and their voices as youth poetry ambassadors, and President Obama himself has mentioned turning to the Class of 2015’s Chapbook during difficult times to enjoy the poetry within. Past NSPP community service projects have included hosting writing workshops for military children at the U.S. Army War College and for Native American youth in North Dakota. National Student Poets have also taught poetry as a form of self-expression to LGBT youth at Out Boulder and Rainbow Alley in Colorado, as well as nursing home residents with Alzheimer’s disease. These workshops have reached diverse communities, presenting subject matter such as poetry and hip-hop, New Orleans and lost homes, and poetry as a means to process tragedy in Sandy Hook, CT.
To view a video discussing the history and impact of NSPP, visit https://vimeo.com/141582461. 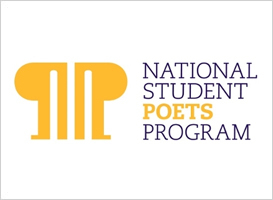 All student works in consideration for the National Student Poets Program are judged based on exceptional creativity, dedication to craft, and promise by a jury of luminaries and leaders in education and the arts. This year’s panel of judges included Kwame Alexander (Newbery Medal-winning poet), Jennifer Benka (author and executive director of the Academy of American poets), Michael Earl Craig (Montana State Poet Laureate), Toi Derricotte (professor of writing at the University of Pittsburgh), Edward Hirsch (President of the John Simon Guggenheim Memorial Foundation), Naomi Shihab Nye (acclaimed poet and Academy of American Poets Chancellor) and Alice Quinn (executive director of the Poetry Society of America). “These five talented and diverse young poets bring together a passion for justice with a quest for beauty. Their gifts are prodigious, their hopes enliven the future.” – Edward Hirsch, best-selling author and President of the John Simon Guggenheim Memorial Foundation. “Hearing the Class of 2015 National Student Poets perform their collaborative poem at the Chancellor Conversations was one of the highlights of the 2015 Academy of American Poets’ Poets Forum. It was amazing to read all these great voices during the selection process. The young poets’ works are stunning, smart, sophisticated, deeply woven and wondrous… They are haunting, thoughtful, surprising; their verve and vitality convey important subject matter. Truly I love them all!” – Naomi Shihab Nye, award-winning poet and recipient of the 2013 NSK Neustadt Prize for Children's Literature. The National Student Poets Program is a signature initiative which reflects the national imprimatur of the President's Committee on the Arts and the Humanities in advancing arts education, links the National Student Poets with audiences and resources in their neighborhoods through the Institute of Museum and Library Services' community-based network of libraries and museums, and builds upon the Alliance for Young Artists & Writers' long-standing work with educators and creative teens through the prestigious Scholastic Art & Writing Awards. The program works in coordination with the Library of Congress and the U.S. Department of Education and the academic awards are generously provided by the Bernstein Family Foundation. More information on the NSPP can be found at www.artandwriting.org/NSPP. The President’s Committee on the Arts and the Humanities (PCAH) is an advisory committee to the White House on cultural issues. Its core areas of focus are arts and humanities education, cultural diplomacy, and community revitalization. First Lady Michelle Obama, like other First Ladies before her, serves as honorary chairman of the committee. To learn more, visit www.pcah.gov. The Institute of Museum and Library Services is the primary source of federal support for the nation’s 123,000 libraries and 35,000 museums. Its mission is to inspire libraries and museums to advance innovation, lifelong learning, and cultural and civic engagement. Its grants, policy development, and research help libraries and museums deliver valuable services that make it possible for communities and individuals to thrive. To learn more, visit www.imls.gov. The Alliance for Young Artists & Writers, a 501(c)(3) nonprofit, identifies teenagers with exceptional creative talent and brings their remarkable work to a national audience through the Scholastic Art & Writing Awards. Founded in 1923, the Awards program is the longest-running, most prestigious initiative of its kind, having fostered the creativity and talent of millions of students through recognition, exhibitions, scholarships, and publications. Over the past six years alone, students have submitted more than a million works of art and writing and more than $30 million have been made available in scholarships and awards to top winning participants. To learn more, visit www.artandwriting.org.